Replace your old screen doors with new, double pane, energy-efficient screen doors. We can change or add screen patio doors for a new look! Folkers takes great pride in our custom, hand-crafted screen doors built with the highest quality materials and the latest technology. We build our doors to last, with the strength and durability needed to stand up to even the highest traffic business or home application. Folkers aluminum screen patio doors are fully adjustable to fit even out-of-square openings. Adjustable in height and width, they can be hung left or right and with an in-swing or out-swing opening. Screen doors may seem like a pretty nondescript feature but they actually provide a major assistance to the interior of your home. 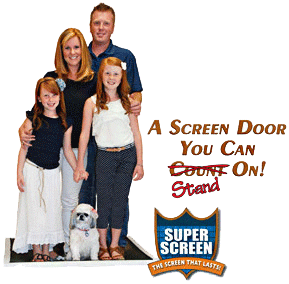 First of all, screen doors increase your comfort by allowing a relaxing and refreshing breeze to enter your property but without all the associated insects and debris. This circulation helps to filter the indoor air in your home, which can eliminate toxins, dirt, and dander while creating a more breathable interior atmosphere. When you are able to open your screen door and get a comfortable breeze entering your home or business, it can also allow you to shut off the AC system, which in turn cuts down on your utility bills. We also install entry doors, french doors, sliding doors, and more. Have you seen our video gallery or our photo gallery?